Thaw two sheets of puff pastry and roll it out. With a pastry cutter, cut strips out of the pastry (approx. 3″x12″) – you will need a total of six strips so you may have extra… nothing wrong with that! Lay on a parchment-lined cookie sheet (you’ll likely need to do two batches). Poke holes with a fork down the center of each strip. Brush with water and sprinkle some granulated sugar on each. Bake at 400°F for 5-7 minutes. The amount of sugar you sprinkled might brown it quicker. Not a horrible thing, just keep an eye on the pastry. Let it cool. Line the bottom of a baking dish with three pastry strips. Slather (yes, slather) with raspberry jam (or any jam of your liking). 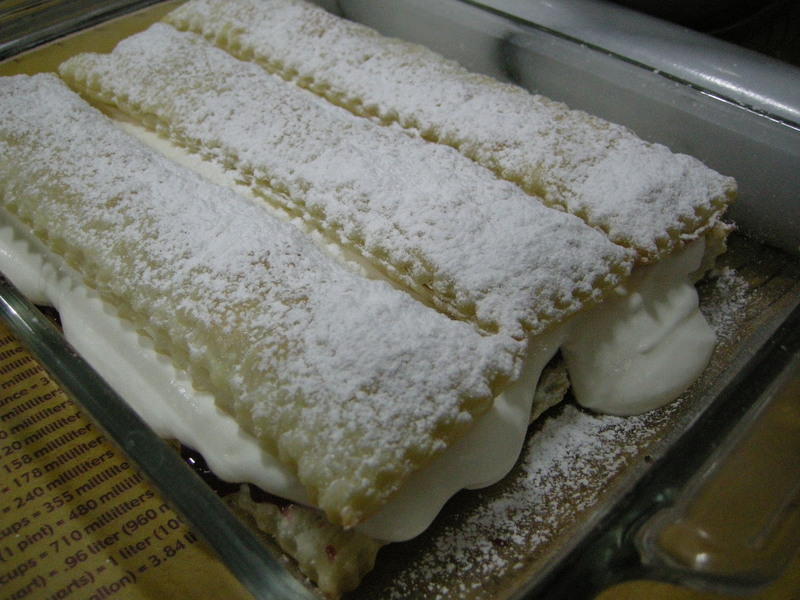 Generously spoon and spread a layer of the pastry cream over the jam. Finally, place three more pastry strips over the cream layer and dust like a mad wo/man with icing sugar. Tah-dah! Instant love! And you’ll likely have some leftover everything there so why not make a Pastry Hoagie?